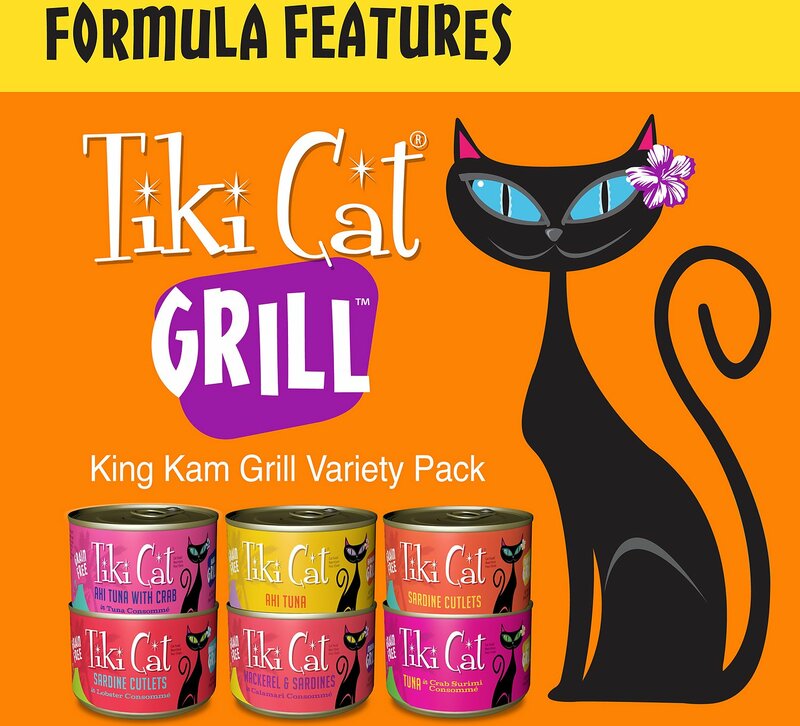 Feed your cat like a king with the Tiki Cat King Kamehameha Luau Variety Pack Grain-Free Canned Cat Food. Inspired by the flavors of a luau, each gourmet recipe is loaded with high-quality protein to keep your pal looking and feeling his best. So grab the catnip grass skirt and dance to the dinner bowl—your tiny carnivore will love the shredded meats in juicy consommé in every can. 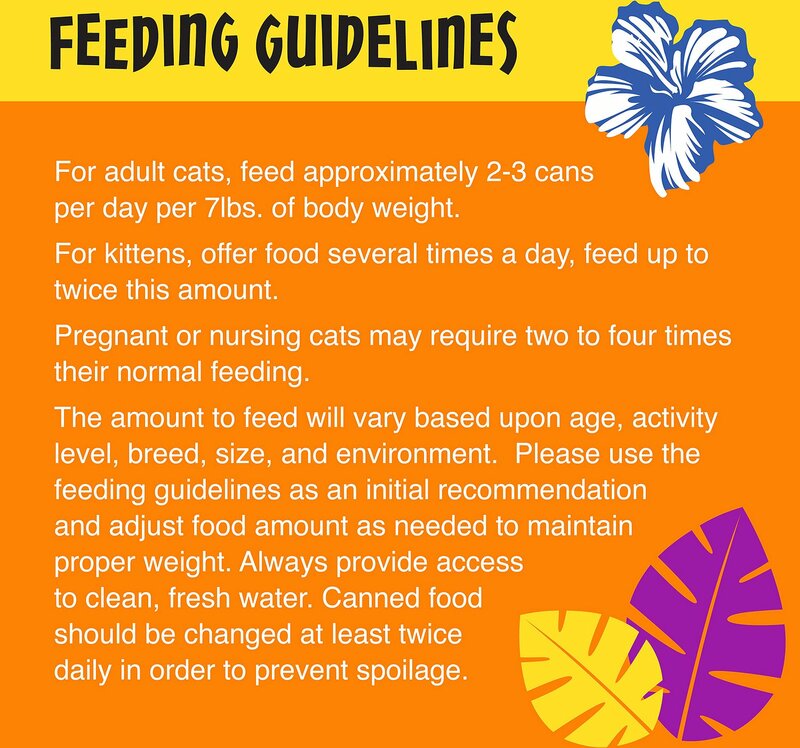 And not only are they delicious and full of complete and balanced nutrition, but the easy-to-serve cans are an excellent way to supply your cat with necessary hydration to keep him thriving. Plus, he’ll love the variety of tasty ingredients, like sardine, ahi tuna, crab and mackerel! 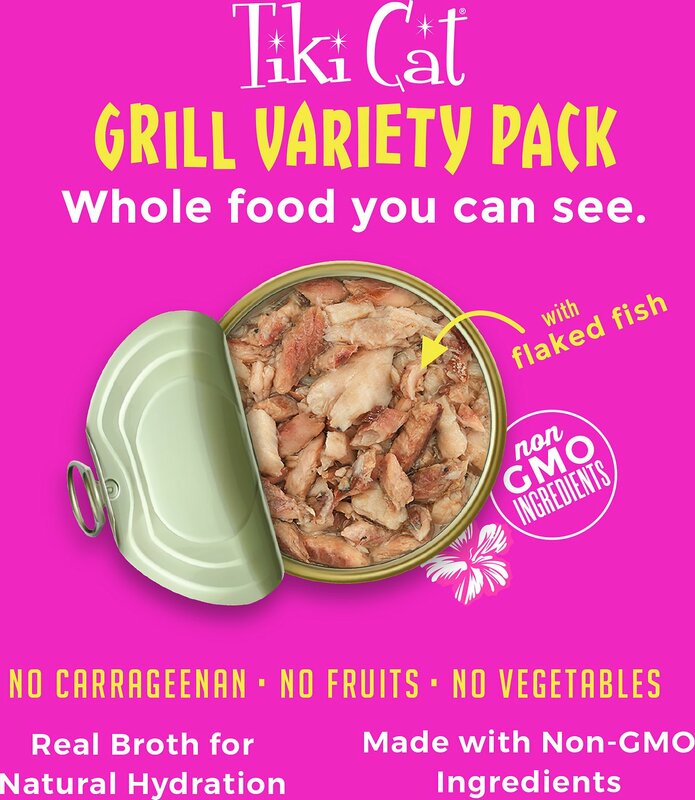 Recipe contains no grains, wheat, corn, soy, GMO ingredients, MSG, carrageenan, or anything artificial so it’s great for cats with allergies. Variety of delicious flavors help to entice picky eaters with real, shredded, deboned meat in a luscious consomme. Hawaiian Grill: Flaked Ahi Tuna, Tuna Consommé, Sunflower Seed Oil, Calcium lactate. Contains less than 1% of the following: Tricalcium Phosphate, Choline chloride, Taurine, Vitamin E supplement, Zinc sulfate, Ferrous sulfate, Thiamine mononitrate, Niacin, Calcium pantothenate, Manganese sulfate, Vitamin A acetate, Potassium iodide, Copper sulfate, Riboflavin Supplement, Pyridoxine hydrochloride, Folic acid, Vitamin D3 Supplement, Vitamin B12 Supplement. Lanai Luau: Flaked Ahi Tuna, Tuna Consommé, Flaked Crab surimi (Sea Bream, Crab broth) Sunflower Seed Oil, Calcium lactate. Contains less than 1% of the following: Tricalcium phosphate, Choline chloride, Taurine, Vitamin E supplement, Zinc sulfate, Ferrous sulfate, Thiamine mononitrate, Niacin, Calcium pantothenate, Manganese sulfate, Vitamin A acetate, Potassium iodide, Copper sulfate, Riboflavin Supplement, Pyridoxine hydrochloride, Folic acid, Vitamin D3 Supplement, , Vitamin B12 Supplement. Tahitian Grill: Sardine Cutlets, Sardine Consommé. Contains less than 1% of the following: Sunflower Seed Oil, Locust Bean Gum, Guar Gum, Choline chloride, Xanthan gum, Paprika, Taurine, Vitamin E supplement, Zinc sulfate, Ferrous sulfate, Niacin, Thiamine mononitrate, Calcium pantothenate, Manganese sulfate, Potassium iodide, Vitamin A acetate, Riboflavin Supplement, Pyridoxine hydrochloride, Copper sulfate, Folic acid, Vitamin D3 Supplement, Vitamin B12 Supplement. 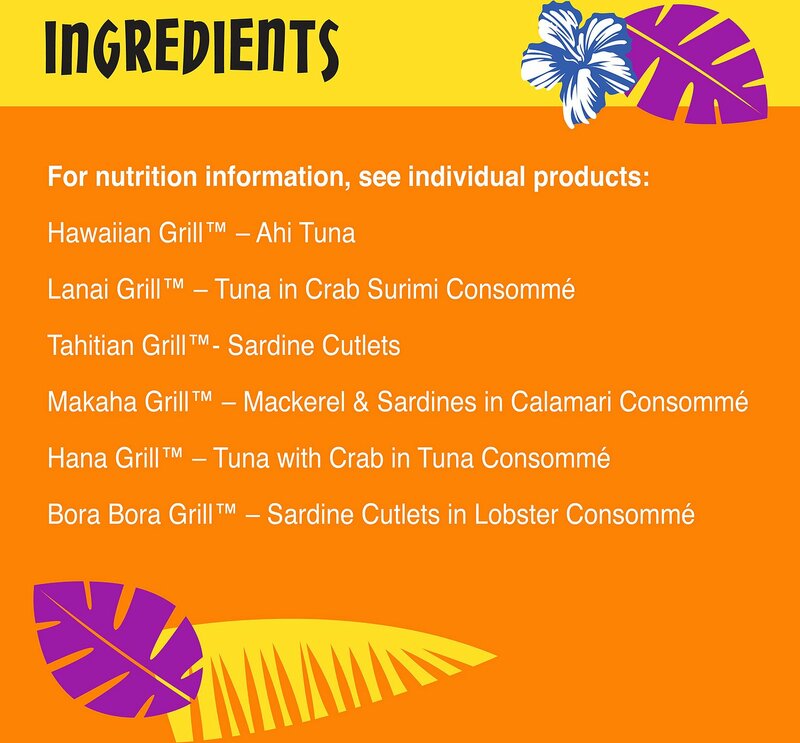 Makaha Luau: Mackerel Cutlets, Sardines Cutlets, Calamari Consommé, Calamari, Contains less than 1% of the following: Sunflower Seed Oil, Locust Bean Gum, Guar Gum, Choline chloride, Xanthan gum, Paprika, Taurine, Vitamin E supplement, Zinc sulfate, Ferrous sulfate, Niacin, Thiamine mononitrate, Potassium iodide, Vitamin A acetate, Calcium pantothenate, Riboflavin Supplement, Pyridoxine hydrochloride, Copper sulfate, Manganese sulfate, Folic acid, Vitamin D3 Supplement, Vitamin B12 Supplement. Bora Bora Luau: Sardine Cutlets, Lobster Consommé, Sunflower Seed Oil. Contains less than 1% of the following: Locust Bean Gum, Guar Gum, Choline chloride, Xanthan gum, Paprika, Taurine, Vitamin E supplement, Zinc sulfate, Ferrous sulfate, Niacin, Thiamine mononitrate, Calcium pantothenate, Manganese sulfate, Potassium iodide, Vitamin A acetate, Riboflavin Supplement, Pyridoxine hydrochloride, Copper sulfate, Folic acid, Vitamin D3 Supplement, Vitamin B12 Supplement. Hana Luau: Flaked Ahi Tuna, Tuna Consommé, Flaked Crab, Sunflower Seed Oil, Calcium Lactate, Tricalcium Phosphate, Tuna Fish Oil, Choline Chloride, Taurine, Vitamin E Supplement, Zinc Sulfate, Ferrous Sulfate, Thiamine Mononitrate, Niacin, Calcium Pantothenate, Manganese Sulfate, Vitamin A Acetate, Potassium Iodide, Copper Sulfate, Riboflavin Supplement, Pyridoxine Hydrochloride, Folic Acid, Vitamin D3 Supplement, Vitamin B12 Supplement. I have two distinctly different appetite oriented cats. 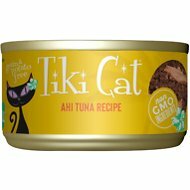 This Tiki Cat food satisfied my picky fish-lovin kitty as well as the preferring meat dude.There were several kitty-lickin good & well made healthy flavors. The sardines are huge pieces. This selection is called 'grilled', so maybe that enticed the meaty boy to try. Both cats LOVED it and I got a discount on my autoship!! My cats were getting bored with Fancy Feast so I ordered this as a test. 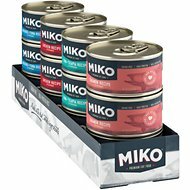 The tuna flavors were a big winner and so was the mackerel, but they wanted nothing to do with the sardines so I gave those to my outdoor cats. I'll buy the tuna individually next time. REAL SEAFOOD......THAT CAN BE SEEN! I've been trying every brand that's grain free along with many other things not wanted in my Meow's food and no pate'. This was the first one that when I opened, I saw big pieces of sardines. You would think I was opening a can of sardines that a person would eat. Meow ate it all, only stopping to look up to see if he was being watched. So this brand as of now is his #1. But still need to try the rest Tiki Cat menu, will save the Tiki Cat After Dark for the final taste test. Will review each after he gives them a taste. Oh, saving my 5 star rating until the final review. Cause that's would really mean it's perfect. Only wish it was sold in a 24 case variety pack. Not sure. Maybe it's just my cats, I don't know. The first can I gave them which was one of the tunas they ate really fast. The second can was the sardine one and they ate that really fast. The 3rd can which was the other tuna they wouldn't touch. So I tried the first kind of tuna and they wouldn't eat it either. I haven't tried it this week, I just gave them their regular food. I might try it again next week. 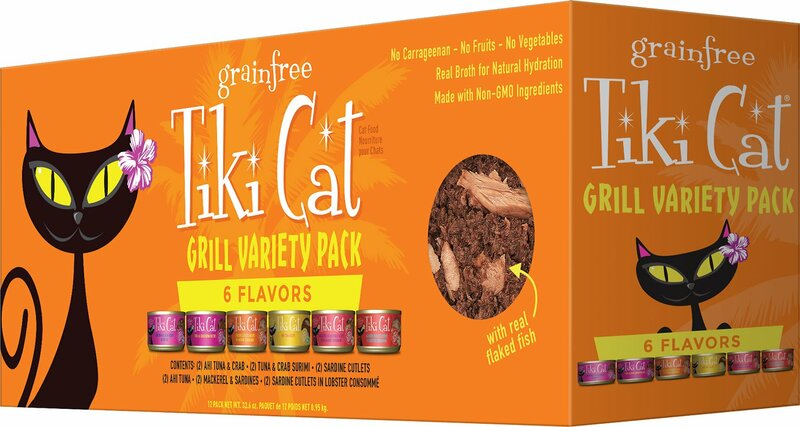 My cats enjoyed all the varieties of this pack except for the Bora Bora Luau (Sardine cutlets). They apparently just don't like Sardines. I was impressed because it was actual chunks of Sardines and thought they would love it. They just licked the liquid and left the fish behind. Wow, looks good, smells good and both my cats scream till I scoop it out of the cans and put it on plates. They turn up their nose at so many premium cat foods. To see them get this excited it worth it. They like everything in the Tiki cat line but the tuna with real shrimp. I seriously looked at it and thought with a little mayo.....but I put it outside for my feral cat.